Tomisato is out in the direction of Narita Airport. In fact, according to the real estate agent we talked to when we went there recently, a good portion of the residents of the city make their living off the airport in one way or another, which may explain the density of motor traffic. The nearest train stations are actually in Narita City, which means everyone drives to wherever they have to go, including their workplaces. It would appear there are almost no Tokyo commuters in this stretch of Chiba Prefecture, which is understandable. At some point, you have to reach a distance where people don’t go to Tokyo to work, but the lack of public transportation is notable. Though it isn’t that far as the crow flies from where we live, getting to the property we wanted to inspect would have taken almost two hours by public transportation, so we rode our bicycles and got there in less than an hour. We met the agent, a young woman in the tan slacks and black polo shirt uniform of Century 21, at the Tomisato City Hall, which had a big sculpture of a watermelon slice out front (Tomisato is the second biggest producers of suika in Japan, though no one we asked knew who’s #1). The property wasn’t far away, but it was off a very narrow road set amidst small plots of farmland, which means we had to wait for a farmer’s minivan to be moved. According to the site plan, the road is owned and maintained by the city, but since it’s only 1.8 meters wide it’s not a proper public road. That means any residential property which lines it is legally a “setback” property, so if the land is redeveloped in any way, the owner has to make allowances for the road to be widened to the legal 4-meter width. In major cities, that extra 2.2 meters might be a problem, but here it was a piece of cake. 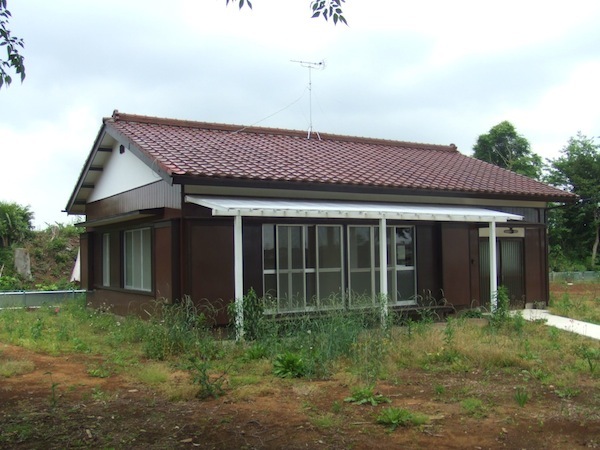 The property we were looking at was a whopping 1,351 square meters (408 tsubo) with a handful of very old, very tall trees lining the perimeter. The house itself, a one story deal with 77 square meters of floor area, was situated in the northwest corner, so there was a large expanse of empty land. Except for one neighbor to the west, there was no one else to see. 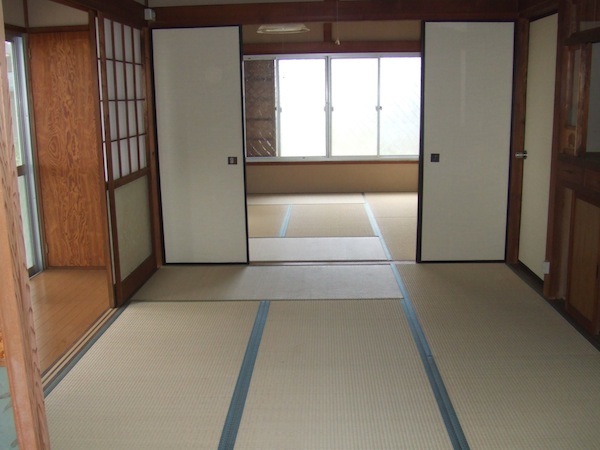 The structure was originally built in 1972, a miniature version of a traditional Japanese house: three tatami rooms separated by sliding doors and a short roka (hallway) in front of a row of sliding glass doors that looked south. 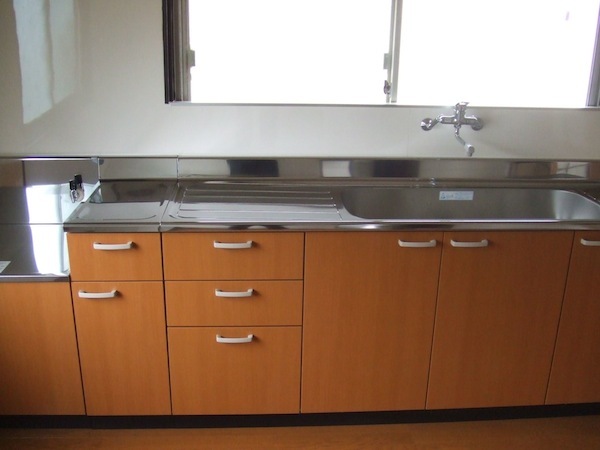 The kitchen and genkan (foyer) were large for such a small place. It was being sold by another real estate company who had bought it from the previous owner and had fixed it up last fall: new tatami, a new exterior paint job (on metal siding); new flooring and cabinets in the kitchen, and a refurbished bathroom. It wasn’t a reform job we would have done ourselves, but this is the sort of one-story house we’re interested in, and with an investment of 7 or 8 million it could be exactly the sort of place we’ve been looking for. 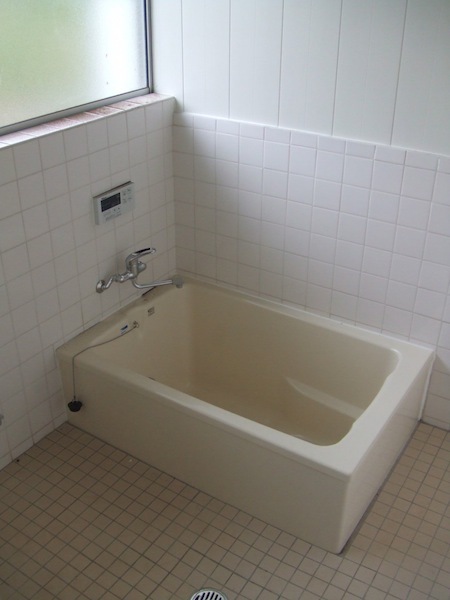 The asking price was ¥12.8 million. It had already been reduced three times since going on sale about a year ago. Originally, the company wanted ¥15.8, then they reduced it to 14.8, 13.7, and now 12.8. The C21 agent said the company was pretty desperate to get rid of it, implying we could probably bargain them down even further. We would have to, since the place needed more work than the re-reform we would have to carry out to make it to our liking. At present, the water was from a well. City water ran up to the edge of the property, but if we wanted to use it we would first have to pay the city ¥300,000 for the rights and then lay pipes from the house to the road, which would cost at least another ¥200,000. 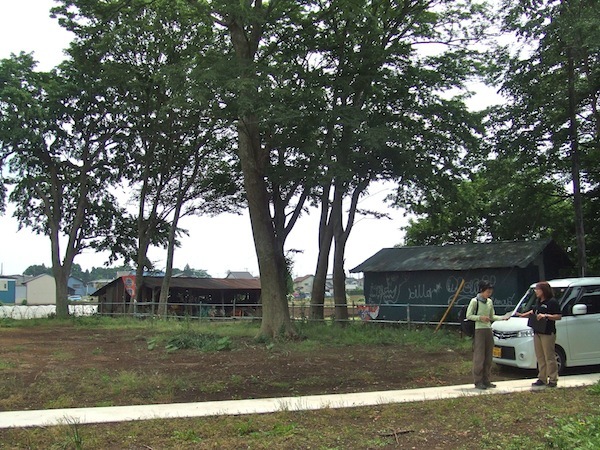 And though the setback condition wasn’t a serious issue (having the road widened wasn’t really an option, anyway, unless all the other houses on the road decided to rebuild at the same time), the property had been designated by the Cultural Agency as shuchi no maizo bunkazai hozochi, meaning land that may contain historical artifacts. If we rebuilt the house and discovered pieces of ancient pottery (kilns used to be prevalent in this area) then legally we would have to report the find to the local and central governments, which would then “advise” us on how to proceed with excavation that we couldn’t refuse. Not only would we be compelled to carry out an archeological dig, but would also have to pay for it. It sounds like a joke, but we’ve heard of condominium projects that were delayed for years because ground work dug up some ancient artifacts that then had to be excavated, thus adding enormous costs to the condo construction and forcing buyers to wait an extra year or two before they could move in. But that’s not the reason we’ll probably pass on the property. Even if we negotiated the price down a few more million, we’re not sure we want to live in Tomisato. The area where the property is located is nice and open and quiet and leafy–in an earthquake it’s nice to have a large piece of land for pitching an emergency tent–but it’s impossible to get anywhere in town or out-of-town without a car, and though we may buy a car again some day, we like the idea of public transportation, and there weren’t even any buses we could see on the narrow public roads. It took us even less time to ride our bikes home. We’re sure it would have taken longer by car. why would anyone remodel a 1960 house??? I’ll catch a cold just looking at those walls. The upside of Japan’s ongoing depopulation process is that people looking for housing will finally hold the whip hand wrt prices. Outside the Yamanote at least. Well, there’s artificial scarcity there too, but the real estate industry can hide it better. I checked it out on the C21 homepage and noted that it really does look close to Narita airport. As it has the appearance of a shack, I guess noise would really be a big problem for this property. Land is a plus point, but 12.8m really looks like an over-optimistic pitch for this for this type of house, especially given the age. Is this “We’re looking for a house, and this is our lastest report” thing simply a fictional framing narrative for a series of real estate posts that you do as part of research for a professional project, or are you really looking for a house? If the latter, you are really going about it in an inefficient, scattershot way. You need to narrow down where you want to live, decide the type of property (condo, house), then list up your must-have and nice-to-have conditions (price, layout), and then take those to local realtors, and follow up regularly. You’re not going to find stuff on the internet. By the time it gets on the internet the good stuff has been filtered out. (After appearing on the internet, the real crap then goes into the printed magazines.) The good stuff gets sold to customers who have created a preexisting relationship with the local realtors. 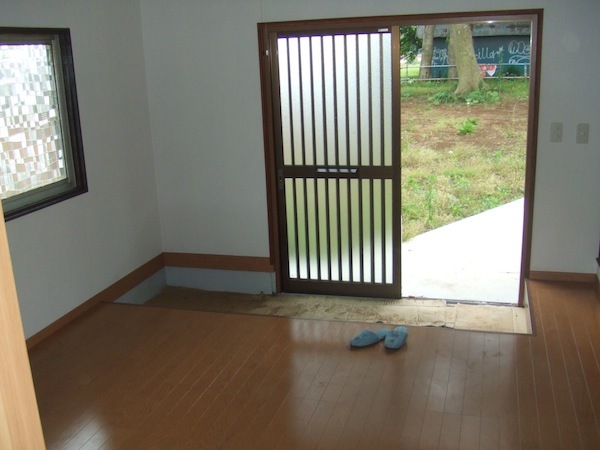 If your reason for rejecting this is that you don’t want to live in Tomisato, and that’s a must condition, why on earth did you go look at a house in Tomisato? I think your biggest problem is that you are looking for something perfect, which you are not going to find, especially at your price point. Thanks for the comment. Though our interest in housing is partly academic, the search is not “fictional.” We would like to find a place to buy, but we have no illusions about what is available at our “price point.” Nevertheless we want to see what *is* available and think that some of the things we learn in the process might be interesting to others in a similar situation. In the past we narrowed down our criteria with regards to price, place, layout, etc., and for all intents and purposes there is very little to choose from within, say, two hours of Tokyo, so if we are going to buy then we have to compromise on something–probably a lot of things. That’s why we look at almost anything, including properties in Tomisato (which we knew nothing about until we actually went there to see this property). “Efficiency” is not our concern. We have cultivated relationships with realtors who know what we want and sometimes suggest properties not listed on the Internet, but the difference isn’t usually that remarkable.